Did you know that you can try Collector for free? You don’t need an account or any setup other than installing the app. 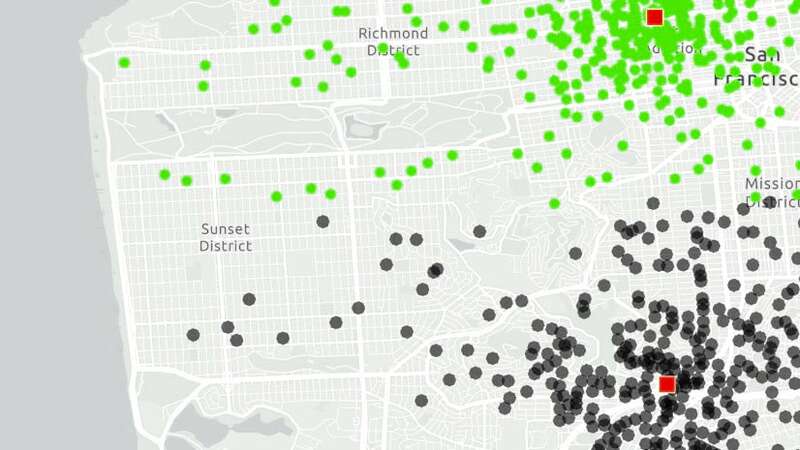 The app includes sample maps that let you jump right into the app and see what it can do. Let’s jump in and go collect data about a local park. You can use any park near you, or you can pretend while in your office. Install the app on your device if you don’t have it yet. Open the app and tap Try it. If you had already signed in to the app, you’ll need to sign out first. Tap the Parks map to open it. 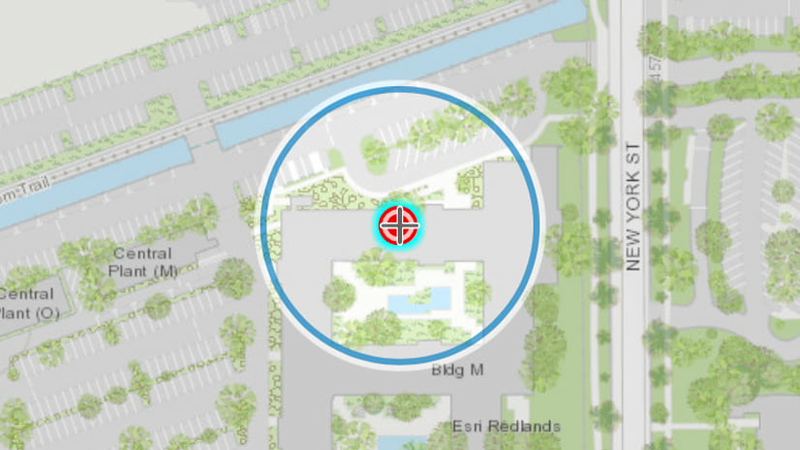 The map opens and, if you allow Collector access to your location, the map centers on where you are. Walk to a picnic table at the park. Tap Add and select the picnic table to capture its location. Tap Take Photo , take a picture of the picnic table, and tap Use Photo to attach it. Once you submit your picnic table, the picture will be available for anyone reviewing the captured data. You notice the picnic table has a broken bench. 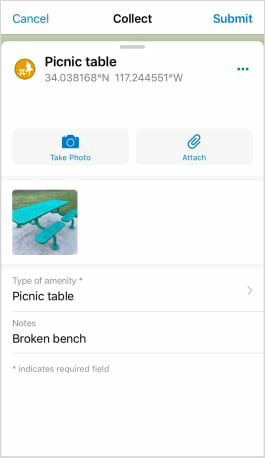 Scroll the form and add a note about the broken bench. 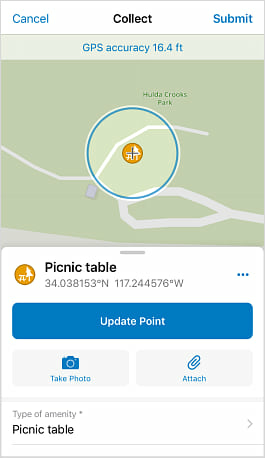 Tap Submit to share the picnic table you collected with everyone who has access to the layer. Next you’ll collect a path. Walk to the start of the sidewalk near the picnic table and tap Add (as you did in step 4). This time, select a paved path. You want to capture the path as you walk along it, so you’ll stream it by tapping Overflow and tapping Start Streaming. Walk along the path, and it is drawn as you go. Once you’ve finished walking the path, tap Stop Streaming. 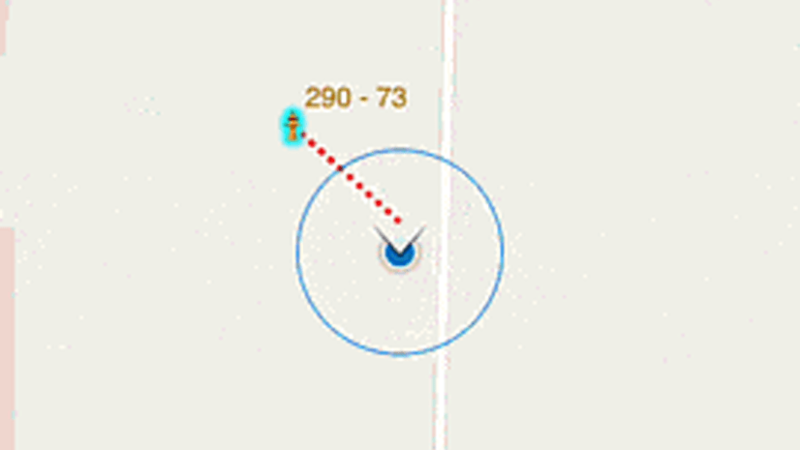 Optionally add a photo and a note, as you did for the picnic table, and tap Submit to add the path to the layer. On your own, capture more information about your park. 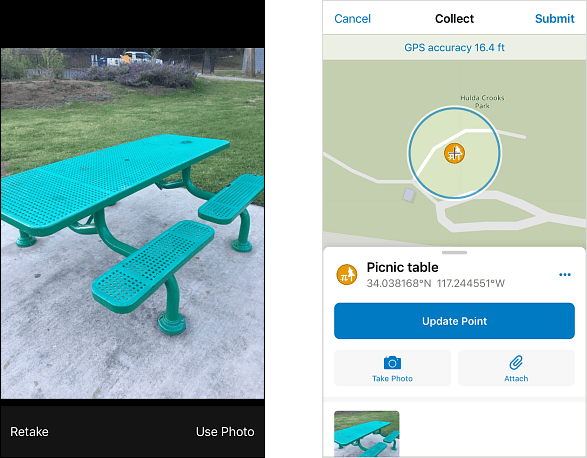 The map is set up to capture benches, lights, trash bins, and trees (among other amenities), as well as other types of paths and various areas (such as dog parks, tennis courts, and playgrounds). You now have a digital version of your park. 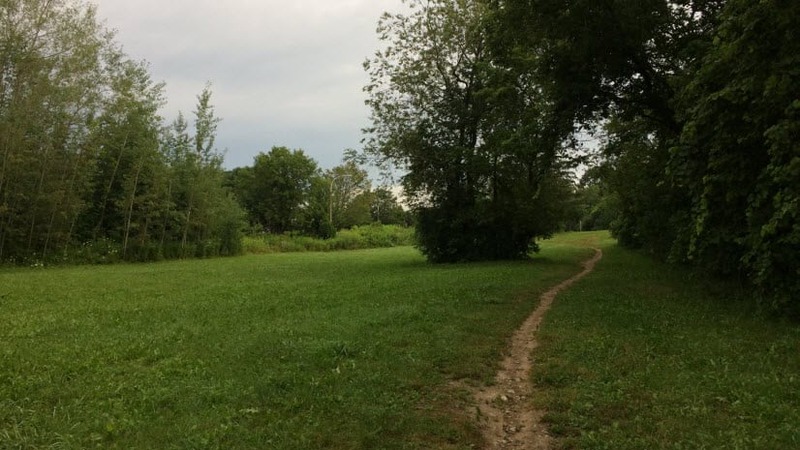 Perhaps your city wants to use it to inventory what various parks have to offer, or you want to create a map highlighting available sports facilities. Data captured in Collector is available throughout ArcGIS and can be brought into other maps, story maps, and apps. Ready to try something else with Collector? Learn how to create the map you used here.